Abstract：At present, the domestic hydraulic oil press has disadvantages of low degree of automation and cumbersome to operate. 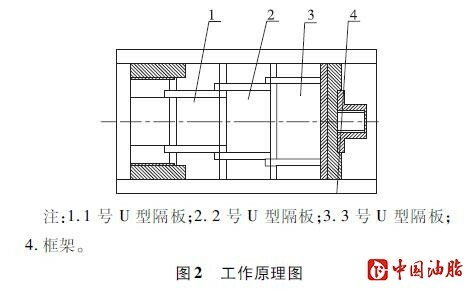 A kind of oil pressing mechanism that could automatically reset after pressing was development. The overall structure and working principle of the oil pressing mechanism were described, unique U-shaped partition structure for automatic reset after pressing was designed, and the cross section of the oil outlet slot was confirmed as inverted funnel insert plate for reducing the pre-pressing or cake making process before pressing oil. The field experiment of the oil pressing mechanism was performed. The results showed that under the conditions of holding pressure 22 MPa and holding time 35 min, the residue oil rate of cake was 11.33%, and impurity rate of oil sample was 0.77%, which could meet the design requirement. 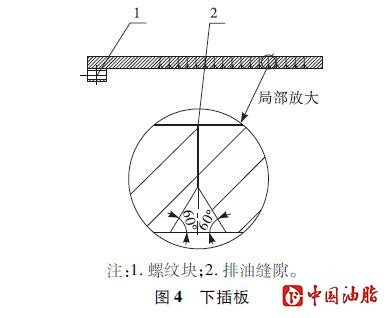 The novel oil pressing mechanism provided reference and foundation for the design of automation of hydraulic oil press. \[1\] 邢朝宏. 油茶籽干燥、储藏及压榨制油工艺研究\[D\]. 江苏 无锡: 江南大学, 2012. \[2\] 王致凯. 我国农用榨油机械发展概况\[J\]. 中国油脂, 1992, 17(增刊): 96-103. \[3\] 王刚. 一种拉杆和顶、底板精密配合的卧式榨油机: CN203805348U \[P\]. 2014-09-03. \[4\] 秦代信. 一种全自动卧式液压榨油机: CN103817969A \[P\]. 2014-05-28. \[5\] 赵玉曙. 一种新型卧式全封闭液压榨油机: CN20546 7490U \[P\]. 2016-08-17. \[6\] 樊祜运. 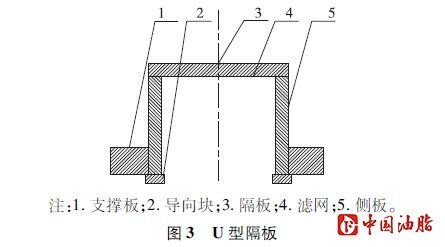 一种卧式立体榨油机: CN204036895U \[P\]. 2014-12-24. \[7\] 李诗龙, 张永林, 杨银初. SZX12×2型双螺杆榨油机的研制\[J\]. 中国油脂, 2010, 35(12): 52-56. \[8\] 刘汝宽, 柯佳见, 肖志红, 等. 油料冷态预榨过程的油脂径向渗流模型及验证\[J\]. 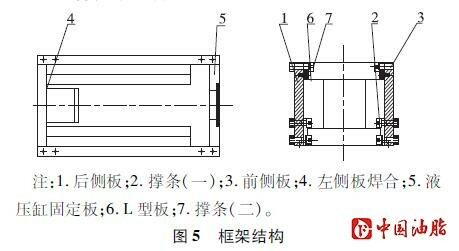 农业工程学报, 2016, 32(19): 274-279. \[9\] GUYOMARD P. Study of the use of a twin screw extruder in preessing-extrusion of oleagineous seeds \[D\]. France Compiegene: Universite Technologique de Compiegne, 1994. \[10\] 郑晓. 油料压榨理论与试验研究\[D\]. 武汉: 武汉理工大学, 2005. \[11\] 倪培德. 压榨法取油及有关理论问题\[J\]. 油脂科技, 1982, 7(1): 27-42. \[12\] 刘汝宽, 杨星星, 肖志红, 等. 蓖麻籽冷态压榨制油过程中油料散体固相力学模型及其参数求解\[J\]. 中南林业科技大学学报, 2016, 36(5): 133-137.